Like his brothers Hubert and Lambert, Jan van Eyck was a painter and illuminator, but nothing is known of his initial training. The first information relating to his activities dates from 1422 when the artist was in the service of Duke John of Bavaria, Count of Holland. On the Duke’s death in 1425 Van Eyck is documented in the service of the Duke of Burgundy, Philip the Good, as painter and valet. Van Eyck also participated in a series of diplomatic missions that took him to Portugal in 1428 to negotiate the marriage of the Duke to Isabel, daughter of Juan I. While there he painted Isabel’s portrait. The artist spent most of 1426 and 1427 in Lille, where he probably worked on the decoration of his patron’s palace. In 1430 he is documented in Bruges where he married, purchased a house in 1432 and died in 1441. During the months following his arrival Van Eyck must have painted a Crucifixion (now lost), which is known from a copy in a Book of Hours in the Museo Civico d’Arte Antica in Turin and another copy in the Galleria Franchetti, Ca’ d’Oro Venice. Between 1432 and 1439 Van Eyck executed most of his surviving signed and dated works. His first known, signed painting is his great masterpiece, The Ghent Altarpiece (The Adoration of the Mystic Lamb) of 1432 (St. Bavo, Ghent). Commissioned by Joos Vijdt and his wife, Lysbette Borluut, it has an inscription by the painter in homage to his elder brother Hubert. Both the inscription and Hubert himself (who for many years was considered to have partly painted this work) have been the subject of a wide range of hypotheses and studies. 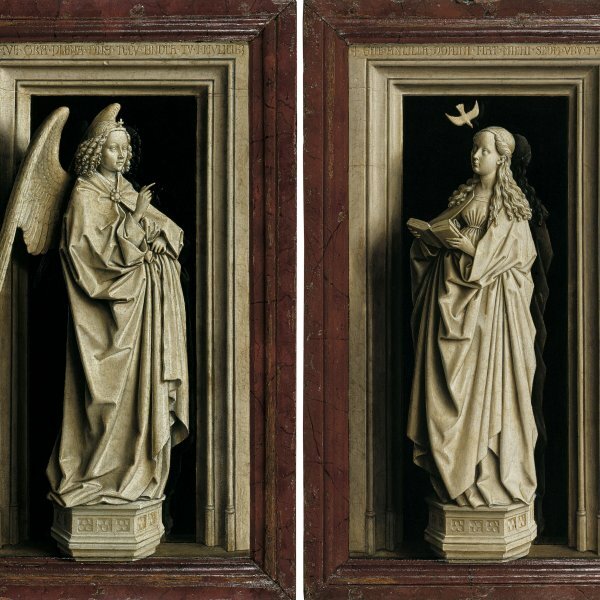 Among Van Eyck’s most important works are The Lucca Virgin (Städelsches Kunstinstitut, Frankfurt), The Virgin of Chancellor Rolin (Musée du Louvre, Paris), and The Virgin of Canon Van der Paele (Groeningemuseum, Bruges). Dating from his last period is The Virgin and Child at the Fountain (Koninklijk Museum voor Schone Kunsten, Antwerp) of 1436, and The Virgin and Child in a Church (Gemäldegalerie, Berlin). Within his oeuvre, Van Eyck’s portraits are equally significant. They include The Arnolfini Marriage of 1434, in which the artist deployed what has been termed “symbolic realism”, and Man in a Turban (both National Gallery, London). In his text on early Flemish painters, Panofsky said of Van Eyck that, “his vision was simultaneously a microscope and a telescope”.